Candy Dreams Slots is a Microgaming slot, new to UK casinos in May 2017. It looks like it is inspired by the popularity of games like Candy Crush Saga, or other candy-themed slots like Pollen Party. As well as sweet and candyfloss imagery, it features 5 reels and variable rows with between 3 and 5 symbols on each. There are 720 win lines available from left to right and two Feature rounds, including Free Spins and a bonus with a maximum 110,00 coin win. A low to medium payout variance, or volatility, and a 96.82% (RTP) Return to Player, along with those 720 winning combinations of symbols make this an ideal slot for some extended game time, if you don’t want to burn through funds whilst chasing big wins, or if you’re looking to hit your wagering requirements. It’s also quite a bit of fun too! You can play this game across all desktop, tablet and mobile devices. When it comes to themes, imagery, and stories in slots, it’s really a matter of taste. If you’re a Thunderstruck 2 or a Lost Vegas fan, then the fluffy pinks, purples and oranges of Candy Dream Slots may not be for you. That said, it’s pretty, and the alternative reel layout is a little different, though not the first of its kind. The symbols on the reels are: 5 small candies – purple, blue, green, orange and red; four large candies – blue oblong, green and bobbly, yellow sunflower and pink floral; the multi-colored lolly pop – the scatter symbol; the game logo and the word ‘WILD’ – the Wild symbols; the pink planet symbol – the second scatter, 3, 4 or 5 of which trigger the Candy Planet Bonus round. And if you’re in the mood, turn up the ethereal wind chime music. Or if you’re not, reach for the volume control, or turn the music off in the settings tab! In the interests of preserving your funds and keeping tabs on your spend, we recommend that you take a look at your stake value before your first spin. You can adjust your coins from 0.01 to 0.5, and your bet range from 1 to 10, giving you a stake range of between 50p and £250 per spin. Candy Planet Bonus – You’re looking for 3, 4 or 5 of the pink planets to appear on the reels to trigger this bonus round which is a very simple, pick-me game with cash prizes being revealed until a ‘Pop’ symbol appears, bringing the game to an end. Up to 110,000 coins can be won here. Look out for the Heart symbol which gives you an extra life in case you reveal the ‘Pop’. The Candy Planet Bonus cannot be triggered during the Free Spins bonus round. Free Spins – A modest 12 free spins can be won when 3 or more swirly lolly pops appear anywhere on the reels. If you see the Gift Box symbol appear anywhere on the middle reel during free spins then up to three wilds are brought into play for that spin. 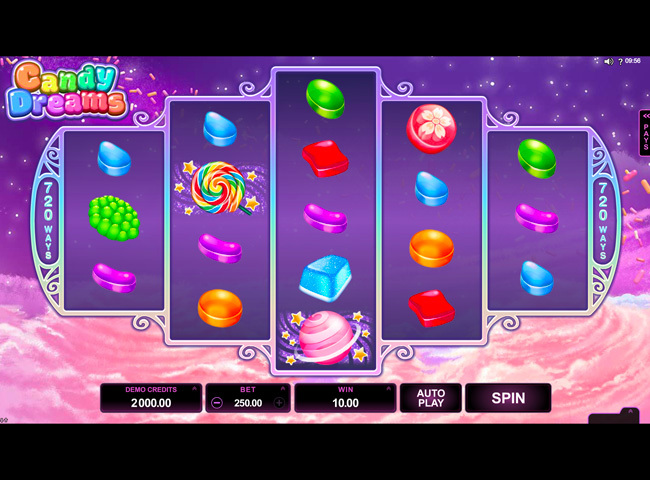 Candy Dreams is a pleasant way to spend some time on the slots. It’s not hugely original, in terms of theme or gameplay, but nonetheless its 720 paylines and low volatility will give you some extended time on the reels for a relatively small budget.